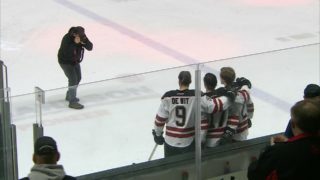 The Red Deer Rebels chased the game Friday night against the visiting Calgary Hitmen but were offensively opportunistic in a 6-2 victory. 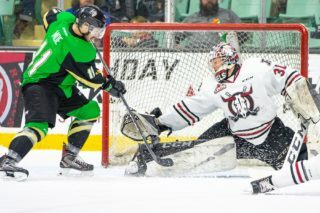 The puck possession game was once again in favour of the away team 24 hours later, but this time it didn’t work out for the Rebels who were 3-2 losers to the Moose Jaw Warriors in a WHL contest that wasn’t nearly as close as the score would indicate. “It’s snowing out, it’s winter time and it’s supposed to be a great day for hockey,” said Rebels GM/head coach Brent Sutter, inserting a bit of humour into the post-game media scrum. “But unfortunately we came out on the wrong end of the stick tonight. We were obviously outplayed, from our top players all the way through. What else do you say? The shots were actually 34-12 in favour of the visitors after 40 minutes, but it could have felt like 40 the way the Warriors were winning the race for pucks and firing away at Rebels netminder Byron Fancy. The rookie stopper was head and shoulders Red Deer’s best player while turning in a 43-save performance. Adam Evanoff basically had a night off at the other end, facing just 18 shots. “I thought our goalie played pretty well, he played solid,” said Sutter. “He held the fort for us because, again, we made a lot of turnovers . . . just not protecting pucks. After the Warriors opened the scoring on a seeing eye shot by defenceman Daemon Hunt 7:18 into the game, the Rebels drew even 39 seconds later when Brandon Hagel swiped at the puck from the side of the net and it glanced off a Moose Jaw defender’s stick and into the top corner. Rebels second-year winger Zak Smith notched a go-ahead goal late in the period, breaking into the high slot and burying a perfect pass from Chris Douglas. But that was it for the home side, who watched Tate Popple connect from the left circle early in the middle frame and defenceman Jett Woo score the eventual winner with a rising shot shortly after. The Rebels were second to the puck and seldom threatened the rest of the way. “Let’s not take anything away from their team,” said Sutter. “They played extremely well, but they have all year. That’s why they only have five (regulation-time) losses. While the Warriors posted their eight straight win, the Rebels, who were lights out impressive for much of the first eight weeks of the season, suffered their fourth loss in a five-game stretch. “We showed a video after the second period about what their tendencies are now and how it wasn’t that way two to three weeks ago,” said Sutter. 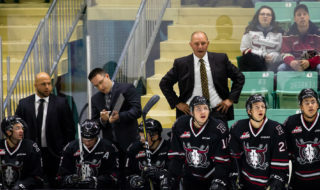 The Rebels relied heavily on their top line of Brandon Hagel, Reese Johnson and Jeff de Wit on many evenings during the good times, but even that unit has fallen off. “That line spent a lot of time chasing tonight,” said Sutter. “That line has to be a good line for us, but everyone else has to do their jobs too. “It’s not just three or four guys, it’s a team thing that we have to get better at, everyone has to. Coaches have to get better, players have to get better and right now we’ve taken a step back. 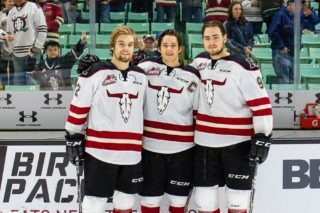 Brett Davis, who along with fellow forward Cam Hausinger was acquired from the Kootenay Ice on Friday, made his Rebels debut after flying in from Seattle, where the Ice played the night before. “He traveled all day and got in here right before game time,” said Sutter. “For his first game, not knowing anybody and going through things with the coaches, I thought he handled himself really well. 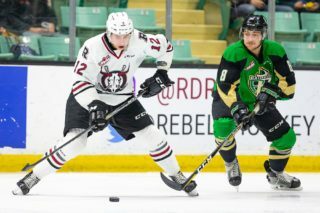 Hausinger is out with a minor injury and is expected to return to action next weekend when the Rebels host the Regina Pats and Swift Current Broncos. The Rebels will conclude a tough stretch of five games in six nights when they face the Hurricanes in Lethbridge on Sunday.